Looking for a Document Conversion or Document Comparison tool? Our file conversion software allows for the saving and restoring of complex 'conversion jobs'. Specify the 'conversion job' within the Windows scheduler, our softwares scheduler, or the command line. C:\>Working sample.bat files included with every install. Command line capability is fundamental to ALL of our software tools. Demo batch files are installed ready for testing and modification. Moving or deleting files while converting documents is no problem at all. This allows for easy, unattended conversion of whole folders. Comprehensive document comparison. 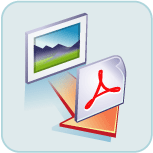 Compare files of all types PDF, Word, Excel, PowerPoint, RTF, TXT, HTM, XML. Retains document formatting. Edit the documents within this application and refresh manually. Comparisons are quick and easy. Easily navigate differences. Compares text from any application. Paragraph differences are highly detailed. Customize the red-lining. Run it from the command line for automation. 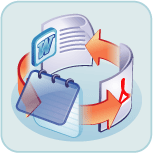 Supports document conversion of PDF, DOC, DOCX, RTF, HTML, TXT and more. MS Word or Acrobat is NOT required. 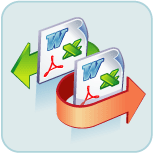 Exptionally fast conversion of PDF, DOC, DOCX, RTF, HTML, TXT and more. Choose between using our own conversion or MS Word's conversion algorithm. PDF Format supported. Highly accurate PDF to Word Conversions. Conversion to PDF/A-1b supported. Move or delete the input files after processing. Convert Excel, CSV and TXT files to many different file types. Copy specific sheet data or a whole set of worksheets from the same or different workbook. Specify ranges. 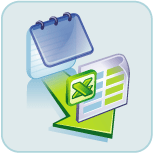 Append or concatenate specified data of a named sheet from a whole folder of workbooks to a single sheet. Change cells value or formula. Move a sheet to a specific place within a workbook. Numerous Excel/CSV/TXT special processing methods. Run from the Command Line or batch files. Command line has been made so simple anyone can use it with no training at all. Supports over 20 image file types. 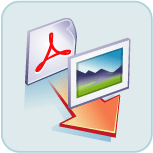 Convert PDF to TIFF, Convert PDF to JPG, Convert PDF to BMP etc. Command line (Invisible at runtime) and GUI execution. Easy to use. Fast file conversions. All parameters, including source and target files as well as conversion options etc. are persistent across runs of the program. Supports BMP, TIFF, JPG, GIF and many more. Convert Tiff to PDF. 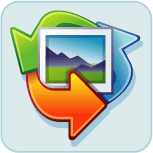 Convert images of many types including TIFF, JPEG, BMP, EMF, GIF, PNG, PCX, TGA, ICO, CUR, ANI, WMF, RAS and J2K. Manipulate images by using special effects or filters. Rotate, resize, flip, shift, perspective, skew, twirl and more. Command line (invisible at runtime) for automating conversions. Convert to PDF or PDF/A-1b, OSI. Special processing on files including appending, removing empty lines, launching third party apps, search and replace. Format the document, page and paragraph before conversion to an image. Great customer service, prompt attention to our requirements and lightening speed development has been my experience with the staff at Softinterface Inc.
WE like the product. It is fast and accurate. It seems to pick up all of the differences in the documents, and it does a good job of displaying those differences. We like the easy to use interface. That is why we bought it!" Downloads. And we're just getting started! Thousands of customers in 110 countries. Don't face the soft facts of life alone. Be a happy Softinterface customer. Utilities to compare files and convert documents? At Softinterface, we offer powerful document conversion and file comparison tools for the most widely used file types. PDF, Word, Excel, Text, CSV, HTML, JPG, TIF for example. Built for ease of use, power and maximum flexibility, our tools will help you streamline your workflow by automating repetitive tasks in your workplace. Why Do I Need Document Conversion Tools? Very often you've just installed a particular software package but can't access the data because it is not in the required format. You need a conversion tool that will change your file from one type to another. That's where we can help. We've developed file conversion and manipulation tools for documents (such as PDF, DOC, DOCX, RTF, HTML and XML. ), spreadsheets (XLS and XLSX), images (TIFF, JPG, BMP and GIF) and text files (TXT, CSV). Another reason is that you have two software applications that need to communicate but can't due to different file formats. Converting files from one format to another will solve this problem. Automating this conversion of files is exactly what our tools were designed for. Use the command line with any of our tools for quick integration. Today people use different kinds of document types all day long to collaborate and work together on projects across all industries. These files can be modified by the original author, or by colleagues. Detecting differences in small files can be relatively easy. However when the files become larger and more complex, detecting changes can become more difficult. That's where our software comes in handy, making detecting changes a simple one. 'Diff Doc', the world's first comprehensive document comparison tool, was built to compare files of all types including PDF, Word, Excel, PowerPoint, HTML, XML, RTF, Text and more. This is very important especially with legal and accounting documents. The length and complexity of real estate mortgage documents are a classic example of how small changes in very large documents could have serious implications. With our tool at your side there won't be any worries. Do you find yourself doing a document comparison or document conversion in the same way day after day? Perhaps you have so many files that you need to compare or convert that doing it one by one is simply not reasonable. In both of these situations, using well-designed software technology can enhance your productivity. Automate your workplace by removing repetitive tasks from your workflow. Since 1999, SoftInterface has been delivering high quality, time-tested software to our customers with ongoing product enhancements. We offer prompt and professional technical support that you can count on. Oh, did we mention the 30 day money back guarantee on all of our products? 'Diff Doc- Document Comparison': "I've been using Diff Doc for a number of years, and it's an excellent tool for comparing documents. I like the side-by-side view especially. It supports a large list of documents types - not only basics like MS Word and the other Office doc types, but pdf files and others. I highly recommend Diff Doc. Its been a huge help." Mike Lowe ('Diff Doc' customer). User interface: Language selection dialog had a bug. Closing using the top right 'control box' we cause app to revert to English. 'Convert Doc': Some Word files were unable to be converted to PDF. 'Convert XLS': Command Line: When using the /K switch to report error level MS Excel would remain in the background. 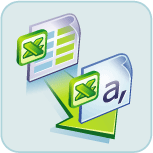 'Convert XLS' Office 2019 compatibility. Latest version of Office 365 compatibility. 'Convert Doc' : Conversion issues addressed. 'Convert PDF to Image' Command line conversion log file issue resolved. 'Convert XLS' Converting XLS/XLSX using MS Excel method. If sheets are hidden, they will be skipped. 'Convert Doc' : Conversions enhanced, and minor issues resolved. 'Diff Doc- Document Comparison': Compare Files: OpenOffice (*.ODT) file types now supported. Must have MS Word version that can open ODT files. 'Convert XLS' : When a sheet name was specified, and the name contained a - (dash) character the 'Convert XLS' would fail to find the sheet. 'Convert XLS' : Log file specified in command line now may have date time attributes. Softinterface corporate web site updated with latest hosting technology to deliver faster dowloads/content delivery. 'Diff Doc- Document Comparison': Compare Folders: Abort button was hidden during refresh. Compare Folders: Having multiple compare folder windows open caused issue after re-starting app.